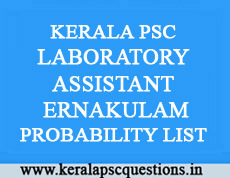 The following is the Probability List containing the Register Numbers of candidates who are found provisionally eligible to be included in the Ranked List, subject to the verification of the Original documents, for selection to the post of LABORATORY ASSISTANT–on Rs.4750-7820in KERALA HIGHER SECONDARY EDUCATION DEPARTMENT (ERNAKULAM DISTRICT) (Category No. 097/2010)on the basis of the Objective Type Test (OMR) held on 15.10.2011. The Register Numbers are arranged in their numerical sequence and the arrangement does not in any way indicate their respective rank on the basis of said Test. The candidates whose numbers are included in the probability list are directed to be present for verification of original documents as per the schedule appended to this notification.